The CMM outreach team held three days soul-winning and follow-up program in Avenor, in the Greater Accra region, on 28th-30th April – 2010. The team spoke to 5 people on the first day. One of them was a Jehovah Witness young man whose question was; “Is Jesus God?” After answering him with the scriptures, he said, “I have been deceived and will like to come to your Bible school”. The whole problem was that he dreamt that he was preaching to a crowd of people. After four days a woman confirmed that with a dream she also had and has since not been herself. At the end of our discussion with her, she was very excited. On the second day, the team was able to speak to eleven people and three of them gave their lives to Christ Jesus. Out of the eleven were six girls who were teenagers, grouped behind a house. The team had much time with them because of the reasonable questions they asked after they had received the salvation message. They invited us the next day to continue with them in the word of God because they wanted to know God. 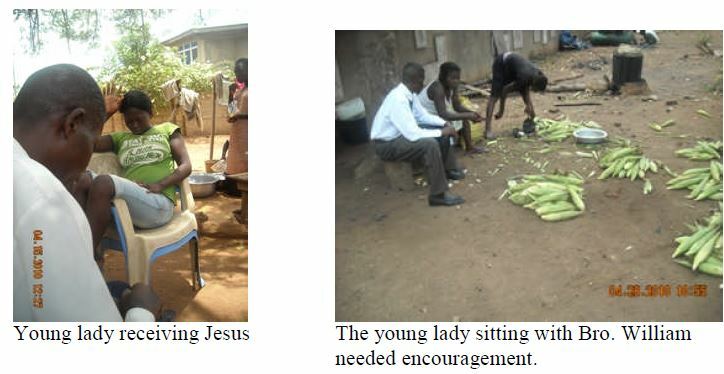 So the team reached out to them the following morning and three of them were waiting there with their Bibles. On the third day of the follow-up process, we encouraged seven people.